Mold cannot produce spores without a moisture source. 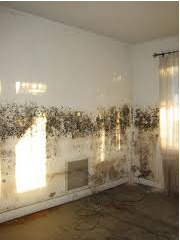 We know water is the foundation of living organisms and mold is surely one of them. 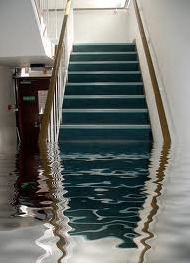 The presence of water into an enclose area is the perfect playground for mold. It can duplicate its existence within 24 to 48 hours. Mold can be overgrown before you know it. 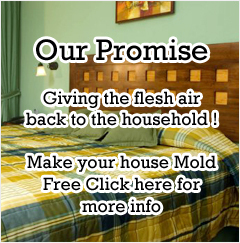 In some cases, your home becomes the perfect environment for mold growth. If your home is lock tight with little fresh air circulation. It can penetrate wall pores with ease. By the time you can see stains on a wall (if it is confirmed mold), there should be enough growth to capture a test sample and enough to establish a RED FLAG. Not all mold spores are harmful. They break down into categories: Allergenic, Hyper-allergenic and Toxic. Some we need (as in yeast), and some we don't. Not everybody responds to mold in the same manner. Two people in the room with the same mold present will exhibit different reactions depending on their particular body resistance. Simply put, our job is to test what's growing in the dwelling and advise on the appropriate course of action. Dead mold is equally damaging to both your health and your home structure. Dead means it is dry and not growing. Live means it is wet and growing. Neither should be tolerated. Dry Mold will spark right back up to life in the presence of new moisture. 1) Direct water intrusion event such as a roof leak, plumbing leak, poorly sealed leaking windows, drain back-ups, water run-off from showers and bath tubs, etc. 2) Indirect water intrusion from "rising damp" such as moisture wicking up from the ground or damp concrete slabs into walls, carpet, cabinets, furniture, etc. 3) Intermittent water intrusion from condensation caused by humidifiers, vaporizers, high steam, inadequate ventilation, faulty windows, and high humidity. The obvious effect of mold growth inside buildings is the damage it causes to construction materials and personal property. The nature of mold is to decompose matter (i.e. your wall, insulation, interior studs and beams). Detecting and addressing mold growth early can significantly reduce the cost to remediate and repair damage caused by mold. However, left unaddressed, mold will eventually destroy everything it grows on. • Washing machines in a room without a floor drain overflow, water with no point of exit will soak into adjacent carpet, drywall and insulation. Solution: always provide a floor drain near the washing machine. • In warm weather, impermeable vinyl wall covering can trap moisture. Mold degrades the drywall and adhesive behind the vinyl wall covering. Solution: use wall covering with impermeable paper or use paint. 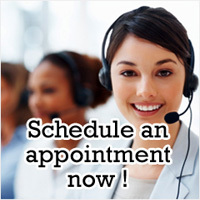 • The condensation pan directly under the coil of your central air conditioner can harbor mold. Solution: before each cooling season, clean the pan and make sure the continuous drain is working. • Leaky air-conditioning creates a moist environment for mildew. Solution: seal all duct joints with special flexible mastic available at heating and cooling supply stores. • Poorly ventilated bathrooms allow surface toxic black mold to grow. Solution: install a bathroom fan or at least an open window. • Water-resistant drywall used as the backer quickly degrades once subjected to moisture. Solution: install cement backer board which will remain structurally sound even if repeatedly subjected to moisture. 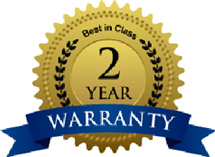 • Poorly constructed crawlspaces promote mildew growth. Solution: store it outside.